Luis Suarez netted a sensational hat-trick as Barcelona thumped arch-rivals Real Madrid 5-1 in the first El Clasico without Cristiano Ronaldo and Lionel Messi since 2007. Former Spain boss Lopetegui was said to be on the brink of the sack after losing to Levante last week and he cut a disheartened figure on the Camp Nou touchline as Madrid were dismantled in his 14th game in charge. The irrepressible Suarez led Barca, who were rampant even without Lionel Messi and capitalised on their rivals’ failings to move back to the top of LaLiga. Philippe Coutinho opened the scoring for the champions and Suarez doubled their advantage in a devastating first-half showing, with Marcelo’s response shortly after the restart merely a small bump in the road. Suarez executed a magnificent header and then a gorgeous dinked finish, before Arturo Vidal added the fifth to prompt a party in the stands as Lopetegui, whose side remain ninth, shuffled towards the exit door. Barcelona swiftly identified the ball in behind as an effective route to goal and so it soon proved. Ivan Rakitic played in Jordi Alba, whose instant control gave him time and space to complete a 30-pass move and pick out Coutinho in the centre for a cool finish after 11 minutes. Madrid’s defensive frailties were again exposed on the half hour as Raphael Varane tripped Suarez in the area and, after a delay as the VAR instructed referee Jose Maria Sanchez Martinez to study the replay, the felled Barca forward tucked his spot-kick beyond Courtois. The half-time introduction of Lucas Vazquez belatedly got Madrid further up the pitch and an improved spell was rewarded with Marcelo’s goal, his third in as many games. Luka Modric whipped an effort against the foot of the post, but that was the end of Madrid’s attacking threat as Barca turned on the style. 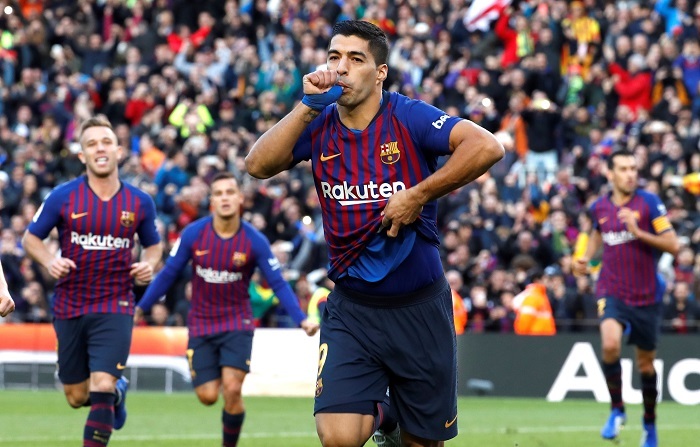 Suarez turned home a Sergio Roberto cross with a stunning header and added a delicious chip over Courtois to complete his treble, before Vidal emerged from the bench to get in on the act with a late header at a raucous Camp Nou. The numbers behind Lopetegui’s tenure do not make for good reading. Starting with him leaving Spain in the lurch by agreeing to join Madrid on the eve of the World Cup, the 52-year-old coach seems to have made the wrong call at every turn. Madrid were torn apart at times on Sunday and the same fate will surely become of his contract. Madrid were sweating on the fitness of Marcelo ahead of this game, but it was the opposing full-backs who shaped the outcome. Alba was sensational and created chance after chance down the left flank, while Sergi Roberto, on the opposite side, kept Marcelo in check with his own hard running. Nacho was seemingly selected as a defensive option on the right, able to keep Alba in check but offering little running the other way in the first half. But that decision merely invited Alba on and, far quicker than his opponent, he enjoyed a fine afternoon. This was the latest – and perhaps last – big call Lopetegui has got wrong this season. From the white heat of the first Clasico of the season, the two clubs head to midweek Copa del Rey fixtures. Barcelona have a trip to Cultural Leonesa, while Madrid visit Melilla.